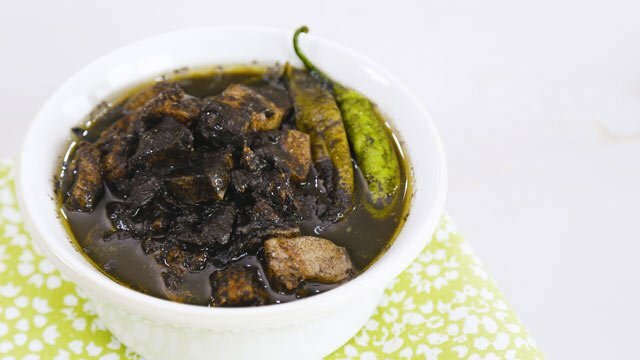 This dinuguan recipe is an Ilocano version of the classic. This Ilocano version of dinuguan (also called dinagaraan) is not soupy but oily, which keeps the dish from spoiling easily. This Pinoy dish may be served with puto on the side! Place pork fat in a pan and cover with enough water. Boil until all the water has evaporated and the pork fat is rendered. Add garlic and sauté in the oil. Continue cooking until the pork fats are crisp. Season meat with salt and pepper then add to the pan. Cover with enough water. Put the chili in and cook until all the liquid has evaporated. Fry the meat for a few minutes. In a bowl, mix pig's blood with vinegar and a pinch of salt. Strain then pour over the meat. Simmer until meat is tender and sauce is slightly thick. Season to taste. Serve warm.